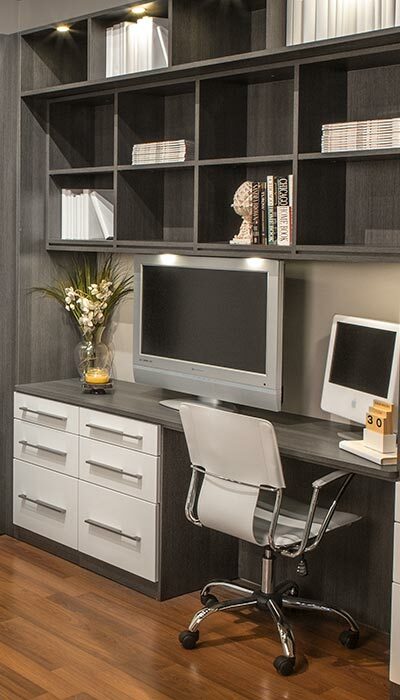 This set up is ultra efficient for a small home office that needs to do double duty as a guest room, or even as a office/bedroom nook in the main room of a studio apartment. The Queenston Oak system components set the background of the room, bringing in modern gray tones and a contemporary but neutral look. 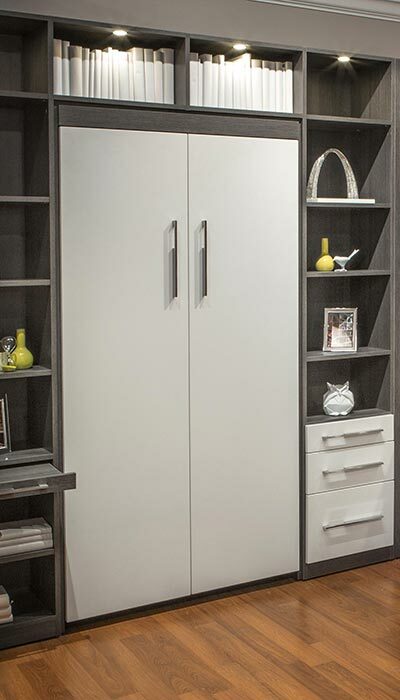 The contrasting white door and drawer fronts lighten the appearance of the room, giving it an open, airy feeling that is so very important in working with small spaces. The Murphy style wall bed stays hidden during the day behind the big white doors, keeping the space all business with its focus on being a work center. At night, the bed can be folded out from the wall, creating a very comfortable room for sleeping, complete with pull-out bedside tables and built-in lighting. Murphy beds were once considered to be a type of gimic for low budget studio apartments. Those humble beginnings have been blown away by the modern Murphy bed. Today's "hidden bed in the wall" is a stylish and elegant storage system that holds not only the bed, but shelving, cabinetry for storage, and often a desk with drawers like this one.